The Polish Ex-Serviceman's Association Branch Australia plays an active role in the local community here but as always continues also to work for Polish causes and for the welfare of their veterans. That work will continue into the future. Today, SPK's, Stowarzyszenie Polskich Kombatantów (SPK) in Australia, goal is to honor and remember those who have sacrificed much in fighting for the independence of Poland during WWII. Polish Ex-Servicemen’s Association promotes and maintains the bonds of comradeship among our members and cooperates with the Ex-Servicemen’s organizations of Australian and Allied Forces. Polish Ex-Servicemen’s Association is maintains the spirit of international companionship amongst all Ex-Servicemen’s of Second World War. We honor those, who even against all odds charged ahead to fight for freedom. Poland, the heart of Europe, throughout the history has seen glorious days. The establishment of Poland-Lithuanian commonwealth in 16th century became the largest state in Europe. It had spread culture and quasi democratic government throughout the Europe. Unfortunately, Poland has also seen many years of conflicts and wars. As the power of the commonwealth declined, it became vulnerable to invasions by neighbouring countries. The borders of the commonwealth were reduced to such an extent that in 1795 it had ceased to exist. In 1918, after WWI, Poland has regained independence only to be torn apart again during the World War II when she was invaded by Germany on September 1st 1939 and by Russia on September 17th. Although, Poland was fully occupied by Germany and Russia, the government relocated to London to help the Allies in efforts to defeat the Axis powers. Those who have remained in Poland established a secret underground Army knows as Armia Krajowa (Home Army) to collect intelligence, coordinate attacks, and to sabotage German and Russian operations. The most famous Poland's contributions in WWII include the battle of Westerplatte, battle of Britain, Warsaw uprising, the breaking of the German Enigma machine codes by Marian Rejewski and his colleagues, and the capture of a German-held monastery at Monte Cassino and many others . These 1,200 Poles had mostly served in General Ander's famous Polish 2nd Corps. Held against their will or imprisoned in Russia, after the Soviet invasion of Poland in September 1939, they formed a new Polish Army on Russian soft following the Germany invasion of Russia. General Anders marched his army across the Soviet Union and out via Iran - his troops then serving with great distinction in the North African and Italian Campaigns. 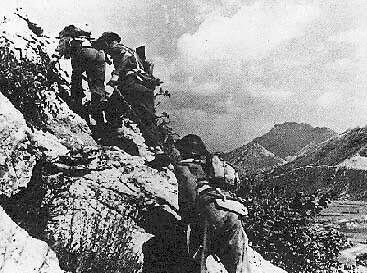 It was this army which stormed the ruins of Monte Cassino. Other Poles arriving had served on nearly every front of the war including the Polish Air Force; the Polish Navy; the Polish First Division of General Maczek; the Polish Independent Airborne Division; and the "silent and unseen" who were dropped into occupied Poland. In 1946 demobilised Polish servicemen formed the Stowarzyszenie Polskich Kombatantów S.P.K. (Polish Ex-Seviceman’s Association) in this country to preserve their cultural identity and to work together for the welfare of Polish Servicemen who had decided to remain here, rather than return to a Poland betrayed at Yalta into the hands of a detested Russian puppet regime. Today the S.P.K. plays an active role in the local community here but as always continues also to work for Polish causes and for the welfare of their veterans. That work will continue into the future. Today, SPK's, Stowarzyszenie Polskich Kombatantów (SPK) in Australia, goal is to honor and remember those who have sacrificed much in fighting for the independence of Poland during WWII. Polish Ex-Servicemen’s Association promotes and maintains the bonds of comradeship among our members and cooperates with the Ex-Servicemen’s organisations of Australian and Allied Forces. Polish Ex-Servicemen’s Association is maintains the spirit of international companionship amongst all Ex-Servicemen’s of Second World War. We honour those, who even against all odds charged ahead to fight for freedom. Organising social events for Members throughout the year, including the End of Year Ball, Andrzejki and the Annual Polish Picnic. Organising cultural events like the Annual Polish Festival, and celebrating the Polish Constitution on the 3rd of May each year. Carrying out administrative duties on behalf of the Polish Association. Acting as custodian of the Polish House, which includes the maintenance and hiring of this facility. Providing support for other groups within and outside of the Polish Community. To become a member of the Polish Ex-Serviceman's Association Branch Australia you must complete the Polish Ex-Serviceman's Association Branch Australia Membership Application Form and your application must be supported by two current Members of the Polish Ex-Serviceman's Association Branch Australia. Forms are also available from the President or Secretary of the Polish Association.